Explanation: The Henbury craters in the Northern Territory, Australia, planet Earth, are the scars of an impact over 4,000 years old. When an ancient meteorite fragmented into dozens of pieces, the largest made the 180 meter diameter crater whose weathered walls and floor are lit in the foreground of this southern hemisphere nightscape. 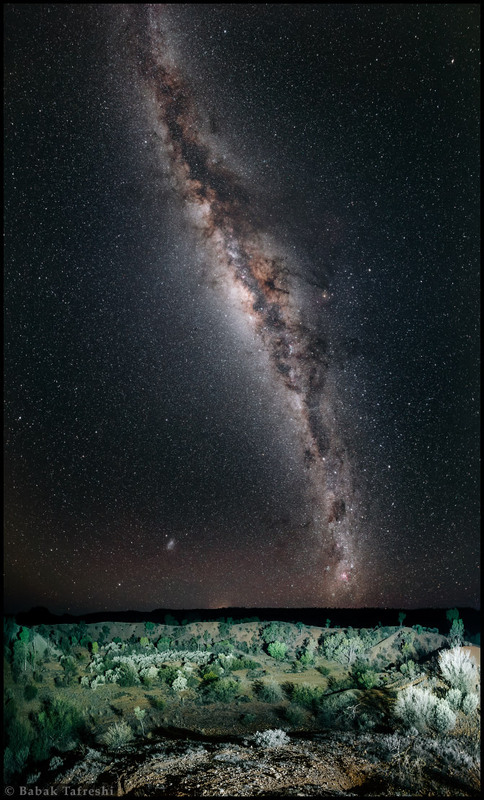 The vertical panoramic view follows our magnificent Milky Way galaxy stretching above horizon, its rich central starfields cut by obscuring dust clouds. A glance along the galactic plane also reveals Alpha and Beta Centauri and the stars of the Southern Cross. Captured in the region's spectacular, dark skies, the Small Magellanic Cloud, satellite of the Milky Way, is the bright galaxy to the left. Not the lights of a nearby town, the visible glow on the horizon below it is the Large Magellanic Cloud rising.